Blue Vervain (Verbena hastate) – Calms agitated outbreaks of anger that come out as grumpy, bitter, irritable or caustic. Shifts your emotional state to one of “sweet calm,” and provides the support system to reconnect your heart with your life purpose. I AM sweet calm emanating from a heart aligned with my life purpose. 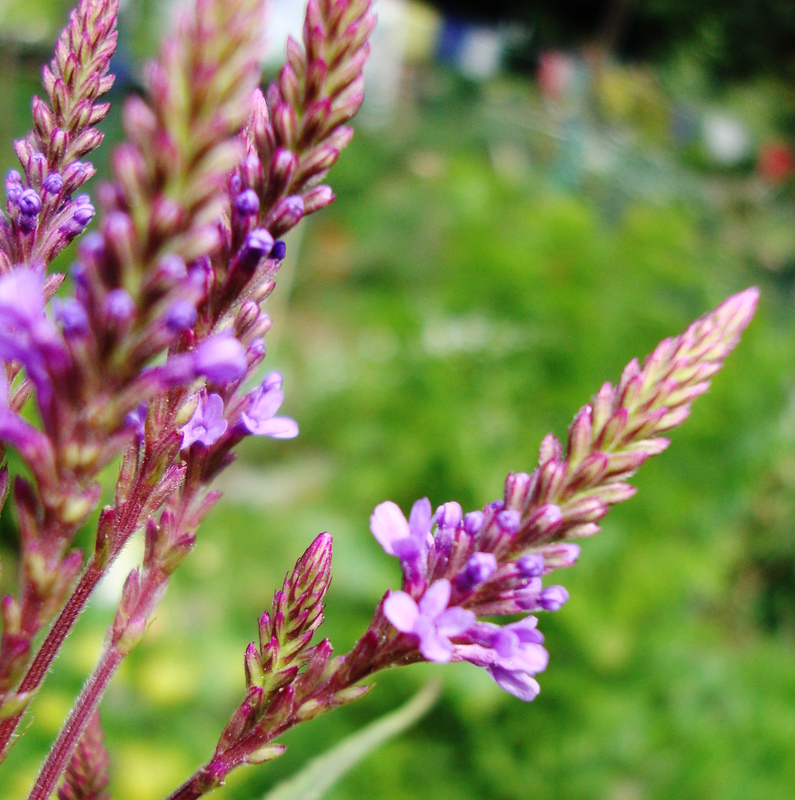 Blue Vervain grows wild in Europe, North Africa, China and Japan. It has long been used to treat anxiety and nervous exhaustion, and to improve digestion. Vervain relieves headaches including migraines related to the menstrual cycle. Use Blue Vervain Flower Essence when you experience anger that comes out as grumpy, irritable, bitter or caustic, possibly with underlying agitation. Physical symptoms can include exhaustion, agitated anxiety and headaches. Underlying the anger, you may experience loss of heart connection with your life’s purpose, to the point of feeling powerless to change that. Blue Vervain Flower Essence calms agitated outbursts of anger and bitterness. These emotions are often a secondary response to a misalignment between your heart and your life purpose. When your beliefs about yourself are not in agreement with what you chose as a soul to fulfill for this lifetime, an interference pattern is set up. This disrupts communication between your Higher Self, Emotional Self and Physical Self. This interference pattern lowers the hertz at which your body/mind resonates, leading to the angry, bitter, irritable emotional state, and a wide variety of physical illnesses. Blue Vervain Flower Essence disrupts the interference pattern and realigns the three selves. This shifts your emotional state to one of “sweet calm,” and provides the support system to reconnect your heart with your life purpose. Blue Vervain Flower Essence was made by the no-pick method of working directly with the plant spirit. While the essence was being made, a matrix of Amber, Amethyst, Blue Quartz, Blue Topaz, Icosahedron Quartz, Lapis, Red Jasper, Sodalite and Drusy Quartz crystals were placed among the plants with the mother bottles. The sun acts as a transformer to step down spiritual energies from higher dimensions. While the essence was being made, Amber acted as a lens to receive and focus sunlight for this purpose. Amethyst brings peace and contentment to daily life. It transmutes dysfunctional energy located in your body and energy fields, then enhances communication between your personal energy fields and spiritual energies. Blue Phantom Quartz - (quartz with blue tourmaline inclusions) assists you to release emotional stagnation, and its comforting resonance aligns your emotional body. Blue Topaz helps you discern what you want, be clear about your aspirations and speak your feelings. It enhances psychic abilities, calms the emotional body and holds the clear resonant pattern of the human body and energy systems. Icosahedron cut quartz has 20 (5X4) equilateral sides. It is a bridge between the 5th Dimension - the entry into the unified Spiritual realms - and the 4 cardinal directions (N, S, E, W) on Earth. Lapis brings truthfulness, openness, inner power, intuition, and spiritual love while being more organized in your daily life. Red Jasper instills physical vitality, emotional balance, and personal integrity. It assists you to move forward with zest instead of feeling powerless to change your life. Sodalite helps you to shift from experiencing your world through worry, anxiety and stress and instead to envision your life from a more serene perspective. Drusy Quartz crystals help to energize and stabilize your subtle bodies. The actions of these crystals inform the way this flower essence seats into your body/mind.